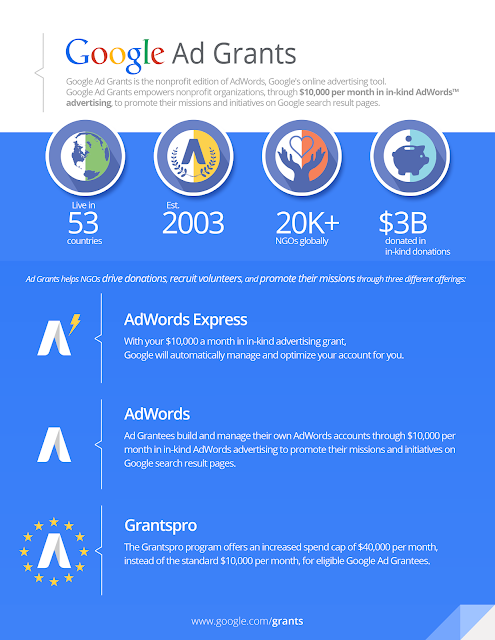 Google Ad Grants! We launched Ad Grants 13 years ago to offer nonprofits a free online advertising solution to share their causes with the world. We’ve celebrated the ability of groups to change the world -- one day, one person, one place at a time. At the same time, we’ve also come to understand the challenges of the nonprofit sector by both listening to your stories, as well as working directly alongside you. In doing so, we recognized that nonprofits struggle to find the time or resources to manage an AdWords account. So in 2015, we launched AdWords Express for Ad Grants as a part of Google for Nonprofits.